News from the BBC confirms that the science fiction future is rushing towards us. It looks like a scene from Blade Runner 2049: A flying drone hovers in the warehouse aisle, its rotors filling the air with a buzzing whine. 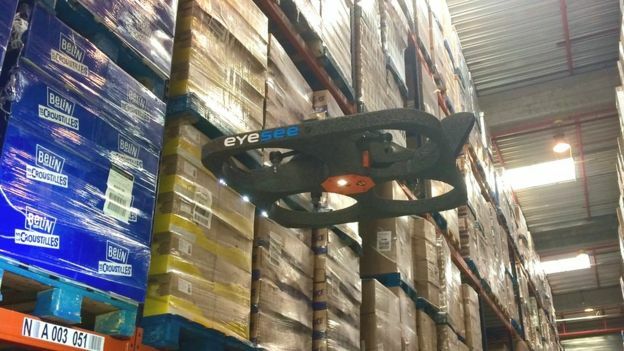 The drone edges close to packages stacked shelves and scans them using onboard optical sensors. But this is no sci-fi film, it’s a huge US warehouse – one of around 250,000 throughout the country. Automated drones are now doing jobs humans used to do: and they’re doing them more cheaply and more accurately. “Every year companies lose billions of dollars because of misplaced items and faulty inventory records in their warehouses,” says Fadel Adib of Massachusetts Institute of Technology. Workers scanning items manually is very time consuming and error-prone. Two drones can do the work of 100 humans, according to supply chain specialist, Argon Consulting. This means they can do several tours of a warehouse – even at night – compare results, identify discrepancies, and build up a much more accurate picture much more quickly. Drone can achieve a scanning accuracy close to 100%, potentially saving warehousing and logistics companies millions of dollars. Want to know more about scanning your warehouse stock by drone? Contact Endurance Drones now.